There are no doubleheaders at the World Series of Poker Main Event, but Tuesday felt similar to a twin bill on the felt. The storm that swept through the valley knocked out the power at the Rio Convention Center late Monday, halting play with almost an hour and a half remaining in Day 5. That made for a lengthy Day 6, as play went deep into the evening until 27 players remained in the $10,000 buy-in No-limit Texas Hold ’em World Championship. Action is scheduled to resume at 11 a.m. Wednesday at the Rio and will continue until the final table of nine players is set. Artem Metalidi held the unofficial chip lead at the 10:30 p.m. break with 36 players remaining. The professional poker player from Ukraine has more than $2.1 million in career tournament earnings. A handful of notable names remained in the field, including 2009 Main Event winner Joe Cada. 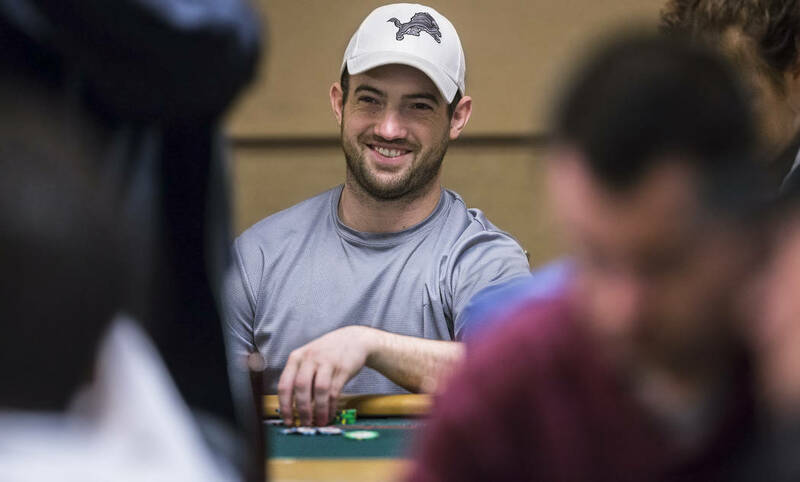 Cada, who won his third career WSOP bracelet in May, scored a key double-up after the dinner break through Alexander Haro and was sitting on more than 10 million in chips. Cada holds the record as the youngest Main Event winner at 21 years, 11 months. He is seeking to become the first player since Dan Harrington in 2004 to reach the final table after winning the Main Event. Scotty Nguyen was 11th in 2007 and Carlos Mortensen finished 10th in 2013. France’s Sylvain Loosli, who finished fourth in the 2013 Main Event, was in the top 10 in chips. Countryman Antoine Labat unofficially held second place at the break. Bracelet winner Barry Hutter also was in the top 10 after holding the overall chip lead at the end of Day 4. Hutter was second in the $3,000 buy-in Big Blind Ante No-limit Hold ’em event this summer. Also in the field were two-time bracelet winner Eric Froehlich, bracelet winner Ivan Luca of Argentina, four-time Circuit ring winner Jeff Trudeau and Circuit ring winners Ryan Phan and Nghia Le. Australian Alex Lynskey, who was second in the $2,620 buy-in Marathon No-limit Hold ’em event last summer, also is lurking near the top 10. Kelly Minkin, the last woman standing in the field, was eliminated in 50th place. France’s Benjamin Pollak fell short in his quest for back-to-back Main Event final tables when he went out in 42nd place.